What If It's Us definitely lives up to the hype that has been building. Usually, I tend to wait a few months before diving into a book that's super-hyped, unless it's by one of my all-time favorite authors. I was lucky enough to obtain an advance copy of this Albertalli-Silvera masterpiece at Book Expo, and as my first Adam Silvera read, I was certainly not disappointed. 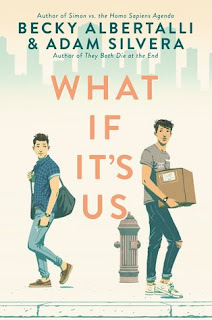 As a gal who grew up in New York City, my favorite part about this book was definitely being able to instantly recognize the places our cute couple visits in the city. This story cracked me up and knocked me down emotionally, so many times. It's the kind of love story that tugs at all your heartstrings and makes you believe in fate, in the universe, and in love. It's the kind of love story that makes you wish you were in love right now and had someone who would take you to have fun spontaneous dates. The story begins immediately with a meet-cute and progresses into a whirlwind of adventures. For a story that ultimately takes place over the course of two months spent in the city, it felt as if time simply flew right by. I loved Arthur and Ben like they were my best friends. They're both cute, quirky, hilarious, and also relatable with their flaws. The chemistry between them feels so incredibly real that I could almost imagine seeing them sitting over coffee at a cafe in the Village. The dynamic between ALL of the characters is also real and raw. There were awkward friendships that didn't sugarcoat the reality of relationships. And the story reminds us that it's always important to acknowledge that no relationship-whether romantic, familial, platonic, or other-is ever perfect and it takes obstacles and hurdles to build the foundation of a relationship. It is also okay for friendships to be rocky and unstable. I also became much more appreciative of New York City after finishing this book. Arthur and Ben's dates make me want to explore this city, while I still have the opportunity and appreciate the beauty and whimsy that simply radiates from it. Sometimes, after living in the same place for all your life, you grow to take it for granted. Throughout these years, I've definitely taken for granted the ease of transportation, the daily endless adventures, and the bustle of the city far too many times that I've forgotten at one point or another, NYC's magic has touched everyone who now call themselves a New Yorker. I’m glad it lived up to the hype. I love both of these authors and badly need this book in my life. I wasn't quite sure what to expect since I hadn't read much from either author, but I pretty much couldn't put it down once I started it! I'm excited to read Adam's other books because of how much I enjoyed this one! I'm so glad you liked this one! I really want to read this one because I recently read They Both Die at the End and I loved it so much. Ahhh I MUST read TBDATE! And More Happy Than Not (since those are the only two of Adam's other books that I currently own). The wait will all be worth it! !